Litigation-technology firm earns top honors in seven trial-support categories of legal journal’s annual “Best of” survey. 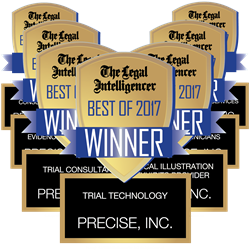 Precise was recognized in seven categories of The Legal Intelligencer's 2017 "Best of" survey. Consistent recognition of our trial services is a testament to our relationships with our clients. Precise, Inc., a trusted litigation-technology firm, is pleased to announce that it has been selected as a top-level service provider in The Legal Intelligencer’s annual “Best of” survey for the eighth consecutive year. The results were announced in the publication’s “Best of 2017” issue, published on October 31st in Philadelphia. Each year, readers of The Legal Intelligencer, the oldest law journal in the United States, cast their votes for the best providers of products and services to the Pennsylvania legal community. Precise has been selected as a favorite provider in one or more categories every year since 2010. This year the company has been honored with seven awards, taking first place in the following categories: Best Trial Technology, Best Demonstrative Evidence Provider, Best Medical Illustration & Exhibits Provider, Best “Hot Seat” Technicians, and Best Trial Consultant. The firm took second place honors in the Best Litigation Consulting Firm and Best Video Deposition Production Services categories. “Consistent recognition of our trial services is a testament to our relationships with our clients. They have high expectations, and we make it our mission to earn their trust by providing unparalleled support,” said Sean Dennin, CEO of Precise, Inc. "We are grateful for the acknowledgment and proud to continue to help our clients in a way that is in line with our core values." Attorneys looking for a reputable team of experienced individuals to provide phase-specific or multifaceted litigation technology strategy turn to Precise, Inc. The company offers advisory, eDiscovery, and trial solutions to law firms of all sizes across the country. To learn more about how Precise can help with your next matter, visit precise-law.com. Founded by attorneys in 2000, Precise, Inc. was established to help law firms and corporate legal teams use technology to level the playing field regardless of the size of the firm or the scope of the litigation. Precise’s subsidiary companies, Precise Advisory, LLC, Precise Discovery, LLC, and Precise Trial, LLC, offer a range of litigation-technology support from eDiscovery services to modern courtroom presentations. To learn more, please visit precise-law.com or call 866-277-3247.